Ahh, my last OUAS post of 2018, and shockingly I don’t have any sock progress to show you! Never mind, though, as what I do have is updates on other projects which use sock yarn (those count, right? ), plus a little round-up of what has been my sockiest knitting year to date. First things first – I failed to update on the 1st (sorry! ), but here’s how my advent knitting project was shaping up yesterday morning (it’s a little more advanced now). It is… yeah, it’s a scarf! I wanted something very easy which I could work on without concentrating every day. I spent some time before 1st December swatching an unexpectedly high number of k2p2 samples with different edgings, to: find the best resulting fabric; help me work out the perfect amount of rows to create the right depth of stripes given the amount of yarn per skein I’d given myself (approx 10g); and work out how many stitches to cast on bearing in mind the amount of knitting I thought I could realistically achieve each day. Turns out I could probably have added an inch or two of width to it, because the knitting time is flying by each day and I LOVE IT (and I’m left with 2-3g of each skein, which I have Plans for so watch this space). 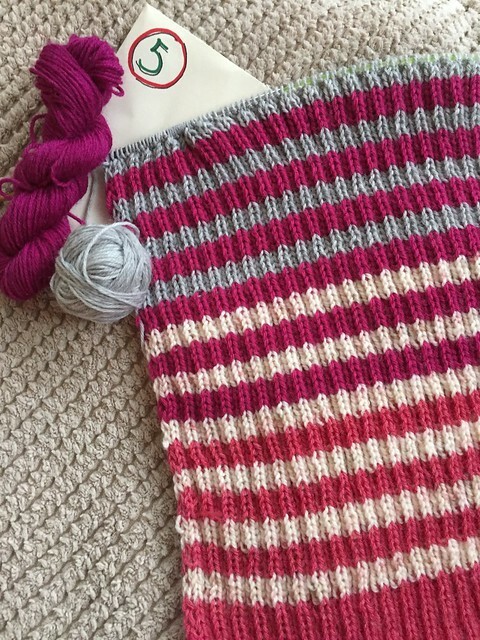 It’s the simplest of scarfs and yet the gradually emerging colour stripe pattern makes me happy every day (and I usually have to stop myself cheating and getting the next skein envelope out of the bag – patience is not my strong suit). Stripes are so pleasing! I eventually chose a knitted-on 2-stitch i-cord to neaten up the sides, which has the happy bonus benefit of hiding the yarn that gets carried up one side (it’s all slightly wobbly at the moment but it’ll block out just lovely). I’m updating on Instagram every day so have a look over there for a daily latest. Pattern: Cast-on 88 stitches using 3.25mm needles. Row 1: (k2p2) to 4 stitches from end, k2, slip 2 purlwise with yarn in front. Repeat row 1 to end. Stripes are 4 rows high. Each yarn should be worked for 24 rows total, with yarns 1 and 24 starting/ending with 12 rows. Cast off in pattern. In other knitting-things-with-sock-yarn-which-aren’t-socks news, I’ve been playing with holding it double to create a firm DK alternative. 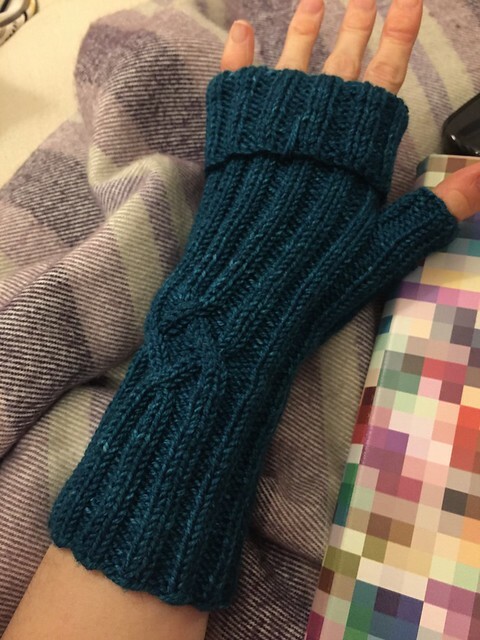 I knocked up this mitt the other weekend – I quite like it, but it’s a little too firm, possibly, for gloves. Still playing with this idea though (I looked at my sock yarn stash the other day and realised I have So. Much. Yarn, so am thinking of create ways to use some of it up). Clockwise(ish) from top left: A beginner’s guide to writing knitting patterns by Kate Atherley (bought after a super-useful and interesting talk about getting your patterns in print); Femiknits t-shirt from Knit with Attitude (which I am, coincidentally, visiting tomorrow with an exciting special guest! more on that another time! ); pin badge and stitch markers from An Caitin Baeg; a wound ball of Travelknitter Pure Merino sock in ‘Dabbling Duck’ (purchased as an emergency keeping-me-occupied skein when I was on the ticket desk and it was quiet – I essentially spent 3 hours winding it and nattering endlessly with other volunteers); Scylfing Sock and Talog Sock both from Triskelion and BOTH no-nylon sock yarns (and completely different from one another, I can’t wait to try them); Yarnporium guide; emergency DPNs. Phew! I could easily have bought more but I did try to restrain myself, truly. And lastly, but very much not leastly, I have had such an awesome sock year in 2018. EIGHT PAIRS, people, and five of them self-designed! This time last year if you’d told me I would have published four sock patterns for sale with a fifth in the works I’d have been amazed. 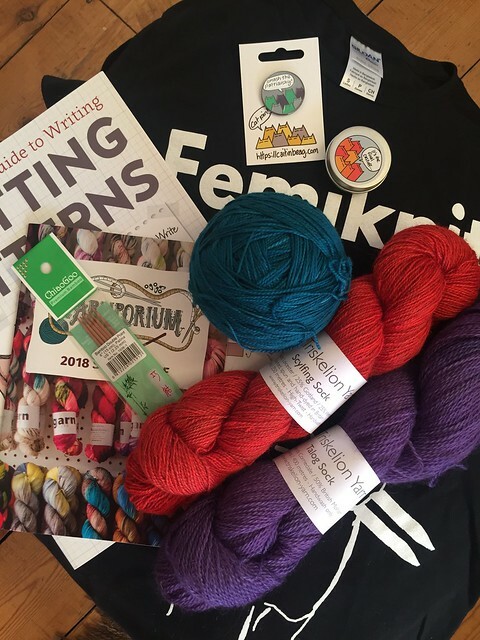 Here’s what I achieved in the sock knitting realm over the last 12 months (that last pair is totally getting finished this month – I literally just have to graft one toe closed and weave away the ends!). Enough socking and yarning for now. As ever, I am one of a bunch of us sock-blogging each month – check out the full set here, Paula’s blog which explains all the details here, and maybe, just maybe, join in too! I like how you’re using your advent yarn. I’m not quite into minis yet but I plan on casting on a Cozy Memories blanket to start using up sock remnants and some minis I bought some time ago and some that I got in a trade. Look at all those socks! And all those published patterns! Well done, Kat! I’m really enjoying your advent knitting adventure! It looks fab!